Hawk Design Lab is a creative space by ZJ Hawk. The Lab features photography, work both built and theoretical, illustration and travels. The thoughts and ideas put forth here are meant to inspire new forms of design. "Remember the impression one gets from good architecture, that it expresses a thought. It makes one want to respond with a gesture." After the latest Japan Drop, I thought that I would follow it up with some analog photography. These scans of my black and white shots really make the surroundings feel ancient. Asakusa is a beautiful place during the day and night; these photos of the lively market goers show just how packed the shopping street can get just after sundown. I like shooting in this medium because you can get a sense of movement that is unparalleled. In many of the photos, I myself was being knocked around by the crowd and the slightly unleveled framing gives that away. The film also gives a nice quality to the movement of people, blurring just enough to hint at the gesture. I hope you enjoy these photos as much as I do and I hope they give you a greater sense of Senso-ji! Pollution impacts everyone everyday. This semester I got the chance to explore the world of Arduino in an attempt to create something that would help people be safer in harsh environments. The Air Aware mask filters the air breathed by the wearer as well as monitors the air around. AA can detect trace amounts of volatile organic compounds or VOCs and many gases to one, protect the user and two, to warn them and those around of the unseen threats. When Air Aware picks up abnormal particles/ gases the Arduino controller changes the fiber-optics from green, blue to red, purple. Air Aware is still in it’s prototype phases and as of now is very crudely pieced together. In construction, we went through many tests and trials of both the housing for the Arduino and air sensor and the mask itself. Finding the best way to display the colors was one of the challenges my team ran into and still needs to be brighter and more exciting. For this version, we used 3D printed housings made of PLA and the bridge connecting the two made of a more flexible 3D printed rubber composite. This drop contains images from a very interesting area of Tokyo called Asakusa. The beads that I received from the Senso-ji temple I still haven’t taken off to this day. This temple complex is extremely spiritual and full of life. In the promenade, souvenirs are sold ranging from small trinkets to large katanas and beautiful kimonos. The main grounds of the temple are protected by the Hozomon Gate. This gate is extremely detailed and holds one of the three ginormous lanterns as well as expertly carved wood figures. The skilled craftsmen of the temple did not only design and built the architecture present here, but they also created the sculptures, details and pictures carved into it. According to the legends of Asakusa, two brothers fished the statue of Kannon (goddess of mercy) from the river Sumida. They tried to put the statue back into the river but fortunately the statue would always return to them. After this phenomenon, they planned to build a temple which started in 628 A.D. and was finally completed in 645 A.D. There is so much this area can offer to anyone visiting. Senso-ji is exquisitely detailed and is best seen on a clear blue day to contrast the red architecture. I would go back in a heartbeat. Osaka is one of my most favorite places I travelled to during my time in Japan. I got to see many famous places as well as a spontaneous festival that truly inspires me to this day. The culture of the city is more relaxed than the rest of Japan and the citizens here do things a little differently. While most of Japanese people ride the right side of the escalator, Osakans ride the opposite. Paired with a heavier dialect, this city is far different from the polished jewel that Tokyo maintains. This rustic 80’s-90’s quality that Osaka has is something that I wish I could find in a city on the east coast. Scaling up from sixty-fourth to a quarter inch model is one of the most challenging fabrication processes I have ever under taken. The design, choice of materials and the planning that was required just to get to building was overwhelming. Overcoming obstacles along the way I reached the final product that matched my original parti of void, solid, void. This balance in design is something I try to achieve in every project. Caution around this industrial lounge. 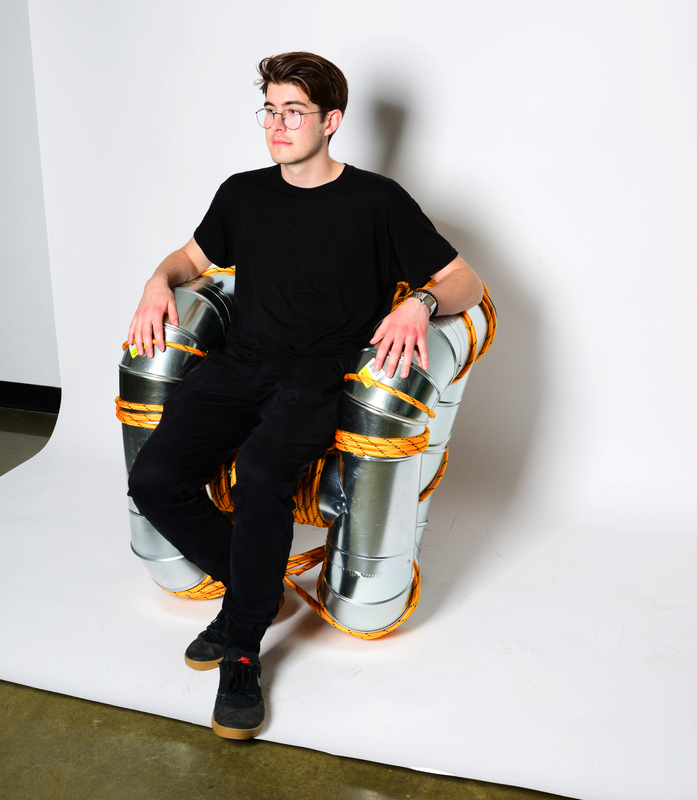 This chair is composed of HVAC elbows and T’s and bright bungie chords. The industrial look struck me as I was walking through the ventilation isle at a home improvement store. After assembling a design right there in the isle, I purchased the pieces and brought them back to the studio. Going through some trial and error the futuristic lounge took shape. This is the first of many; stay tuned! Graphics in the architecture industry are for persuading possible clients to build a project. Illustrations for this purpose deserve long hours and bold statements but where does this mind set go once we’ve gotten the job? Preparing construction drawings is a daunting task to say the least and Revit doesn’t make it any easier. Often times this becomes the most boring part of an architect’s job. I believe that this part of the job should be an exciting process. Drawing up the joinery and figuring out how things really go together is a huge part of architecture and we, as architects, should treasure how a building is put together. Expressing an idea to a builder has a graphic solution contained in the building prints. Why aren’t these graphics that we hand builders graphically appealing? Why can’t these drawings be just as fun as our doodles that inspire design? I would like to experiment with this idea. If the graphics to build a project are just as colorful and fun as illustrations but still maintained the level of instruction would it be a more enjoyable construction for the builder? Tokyo Tower! This is one of the first landmarks that I got acquainted with in Tokyo. I would pass it when I would walk to Temple University Japan (TUJ). The cover photo is the first time I got up close to the tower and I was truly amazed with the area that is immediately around it. Zojo-ji is the Buddhist Temple pictured in the first image. The first time I explored this area was after I went to Minato City Hall, which is really close! This temple is huge and very interesting. Arriving in Japan one of the things I noticed right away was the overwhelming amount technology and how well it was integrated in everything . This is a good example of this juxtaposition of new and old in a simple and effortless way that Japan does so well. The rest of the images are from the lookout inside Tokyo Tower. I was lucky enough to be there during sunset. Seeing the city light up was absolutely stunning. I hope you enjoyed the pictures! Check back soon for another drop! The Maker’s Monolith is a concrete rowhome designed for a bronze sculptor to live, make and sell his work. Within the concrete walls lies a truly spirtual space that blurs the boundaries of inside and out.